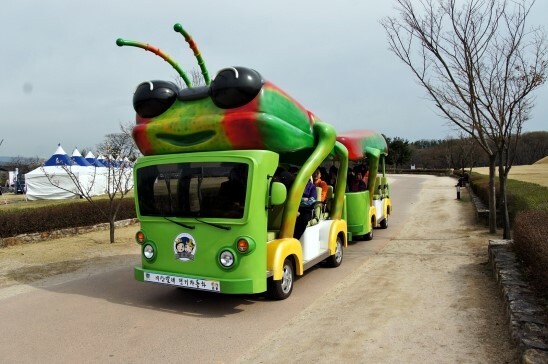 Give a warm welcome to the Jewel Beetle Trolley! 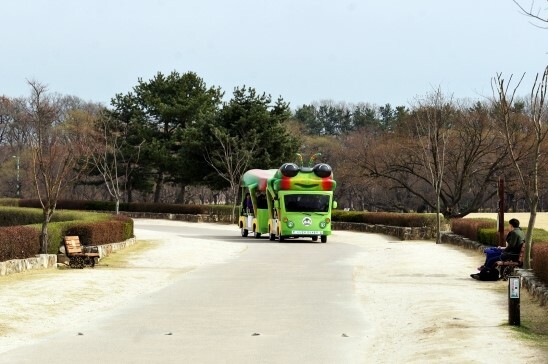 The much-anticipated day when the ‘Bidanbeolle-cha’ (Jewel Beetle Trolley) makes its first official run has finally arrived. The opening ceremony took place on Friday, March 28, 2013, and the trolley service went into full swing the next day. A week before its launch, I joined a test run of the Jewel Beetle Trolley and toured the eastern historical district. 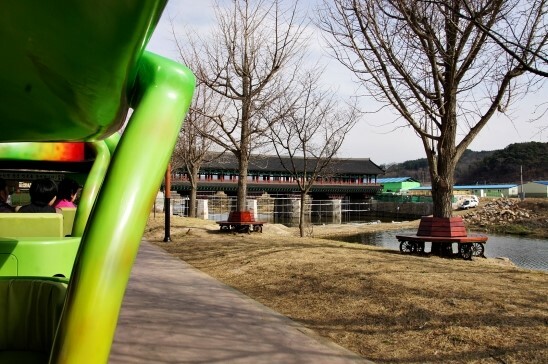 Before taking a ride, let’s find out about the jewel beetle during the Silla era. Shall I call the jewel beetle the ‘motif’ for the Jewel Beetle Trolley, which roves all over the eastern historical district? As the name suggests, this guy resembles a jewel beetle (technically known as Chrysochroa fulgidissima, from the Buprestidae family of beetles), boasting a glossy finish and vivid iridescent tones. The wings of this beetle were used in decorative objects during the Silla era. In particular, a fabulous gilt-bronze horse saddle shield decorated with iridescent beetle wings was discovered at Hwangnam-daechong inside of Daereungwon Tumuli Park, and is now on display at Gyeongju National Museum. It is considered the zenith of jewel beetle ornamentation. Dating back to the fifth or sixth century, this ornamental artifact is richly inlaid with thousands of jewel beetle wings, and their intense, gorgeous hue still remains. 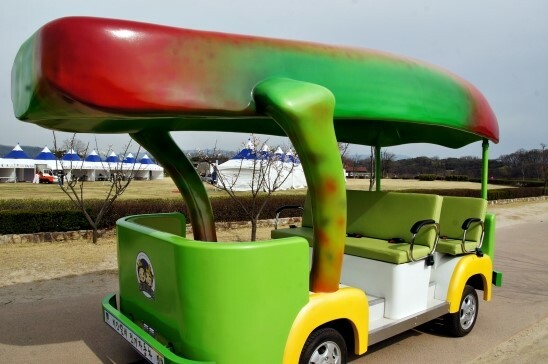 Helping us to imagine the distant past and the flight of jewel beetles around the royal palace, the 21st century Jewel Beetle Trolley began operations. The Jewel Beetle Trolley follows the course shown above. 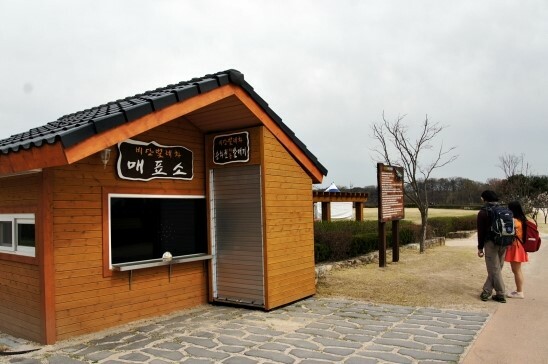 The departure point is in front of the ticket booth of the eastern historical district (an area that includes Wolseong Fortress, Gyerim Forest, and Cheomseongdae Astronomical Observatory). The trolley has a capacity of 22 passengers. It leaves about every 30 minutes. 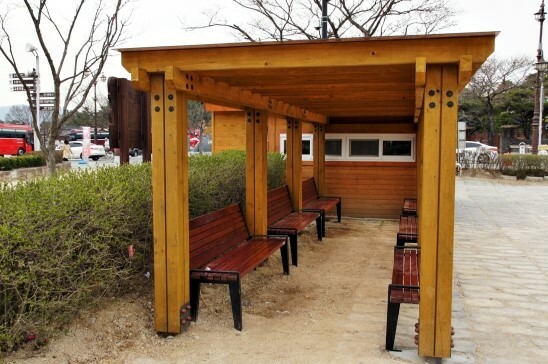 Next to the ticket booth, a seating area has been built where you can wait for the trolley. From Gyerim Forest, we headed towards Gyeongju Hyanggyo. 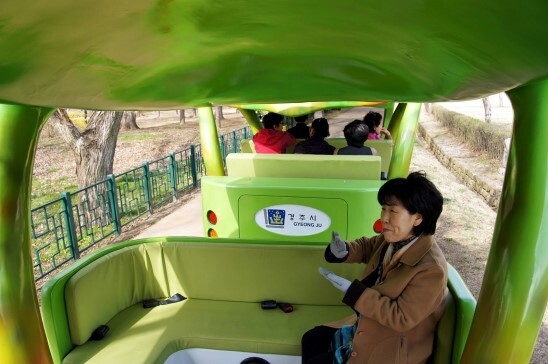 Even though it’s an electric trolley with zero emissions, it doesn’t go through Gyerim Forest, in the interest of protecting cultural heritage. 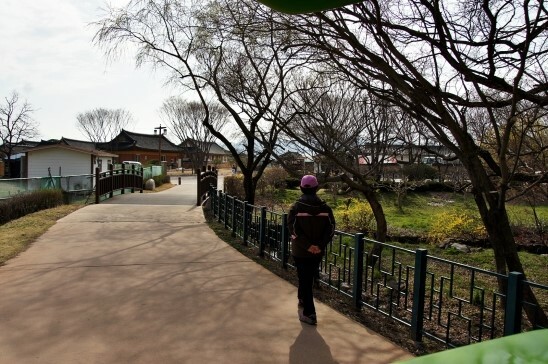 A path has been laid on the outskirts of Gyerim Forest for the electric trolley to travel on. As we passed Gyeongju Hyanggyo, we were joined by an interpretive tour guide. That’s not something you see every day. ^^ She boarded the trolley, saying that she wanted to experience it the trolley in advance while it was still being tested. They told us that passengers can feel free to get off at any time if they want to spend more time at certain trolley stops, as long as those places aren’t too crowded. 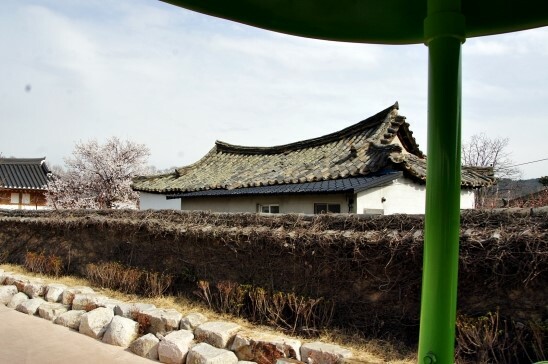 Starting from Gyeongju Hyanggyo, we went all over Gyochon Village, the site of many traditional Korean houses (hanok), including the family home of the wealthy Choi clan. The pace of the Jewel Beetle Trolley is already pretty unhurried, and when going along the village’s paths, looking around here and there, it becomes even more leisurely. Relax and take in all the scenery. 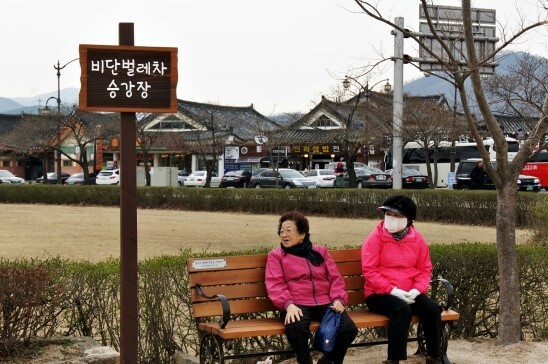 If you want to enjoy Gyeongju in the spring, be sure to visit the eastern historical district. 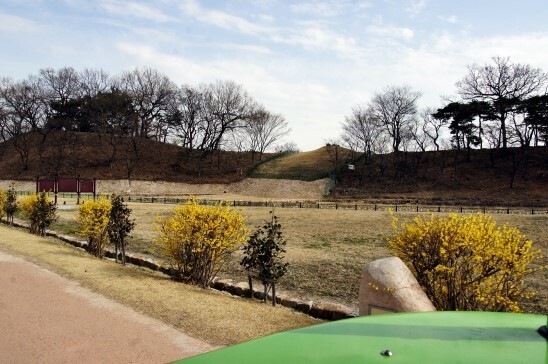 We pass Wolseong Fortress and head towards fields of flowers, where people are hard at work creating the floral landscape that will adorn the colorful spring of Gyeongju. No matter how busy they are, they still have time to smile and wave when a lady on the trolley calls out a greeting. 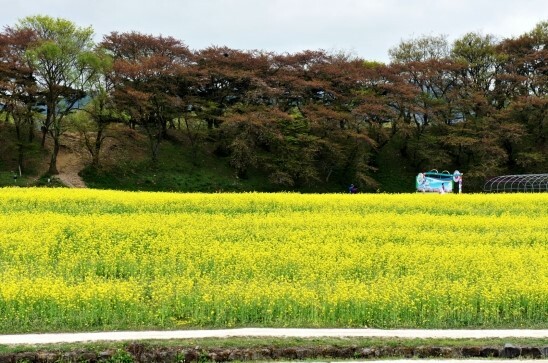 Come mid-April, the fields of this wide spacious eastern historical district will be filled with brilliant lemon-yellow rapeseed blossoms. Waiting is unbearable, but the beauty makes it worth the wait. 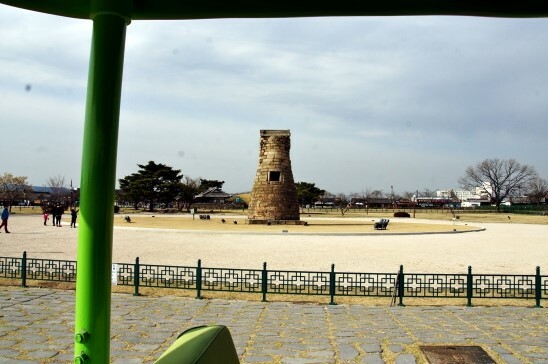 As we finally pass before Cheomseongdae Astronomical Observatory, the 30-minute ride on the Jewel Beetle Trolley is coming to an end. 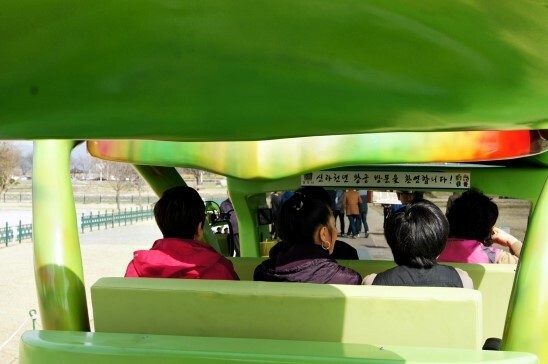 With each attraction the trolley passes, an informational announcement can be heard, explaining the site in both Korean and English. How about taking a listen? 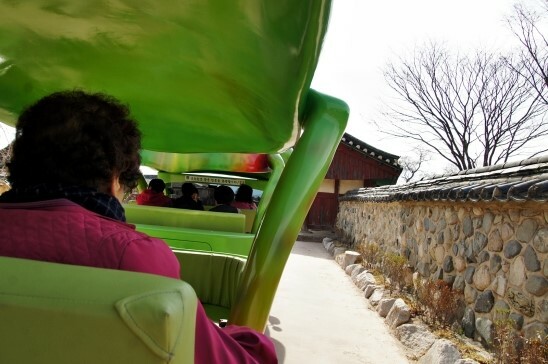 How about saving just 30 minutes to take a ride on the Jewel Beetle Trolley? 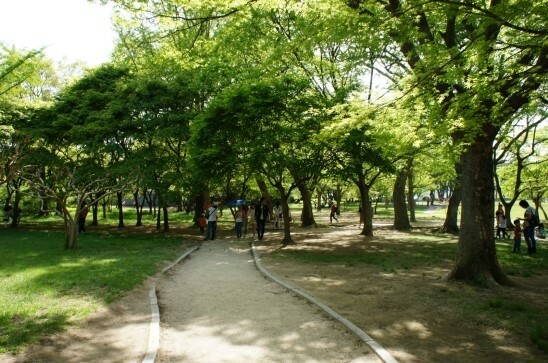 Transported along with the spring breeze, you’ll be able to feel all the glory of springtime in the eastern historical district.